You’ve roamed the alien wasteland of Pandora, fought against the craziest enemies, met no single sane NPC, collected and upgraded an arsenal of weapons, completed the most hilarious quests, and now you’re left wanting for more? From the unique graphics style to the sense of humor, the Borderlands series shines in many aspects. There’s no easy fix for the Borderlands itch but we will do our best to help you find a worthy replacement. Keep in mind that there are three main Borderlands games and one spin-off so if you haven’t played them all you might want to give those a try. Also, don’t forget about the DLCs. If you’ve exhausted all of these options, here are our top 10 games like Borderlands that you can check out as alternatives. Graphics and gameplay wise, this is as closest to Borderlands as it gets. Sadly, humor is the Borderlands element that is missing from RAGE. The game is a first-person shooter set on post-apocalyptic Earth. Players roam the desolated lands in their buggy killing mutants and monsters. The weapon selection is not as generous as Borderlands’ but there are many ways to dispose of enemies and that makes combat fun. Vehicular combat is also fun so it’s worth upgrading and customizing the buggy. RAGE can be played as a single-player story driven game and in co-op mode with friends. The online vehicle combat mode is not too shabby either. A new RAGE game is expected in 2019. Fallout 3 and the following games can be played in first or third-person perspective. The action takes place on a retro-futuristic post-apocalyptic Earth. There are lots of mutated enemies, humans and beasts, to take down and diverse ways to kill them. The character development system is flexible and Codsworth reminds a bit of Claptrap. Fallout has a truly open world to explore and that’s what makes the series fun. Main and side quests keep players busy at all times. The new Fallout 76 is purely an online multiplayer game so you can team up with a buddy just like in Borderlands. If you happen to be a classic RPG fan, we also recommend Fallout 1 and Fallout 2. These are turn-based RPGs with lots of humorous encounters. This third-person action game is based on the Mad Max movie series. The developers did a pretty good job recreating the setting and atmosphere from the movies. A barren world filled with demented enemies, satisfying combat, plenty of things to do, and vehicular combat make Mad Max a good Borderlands alternative. There is no multiplayer but you are not alone either. Chumbucket the mechanic is Max’s companion. He has plenty to say, unlike Max who prefers to keep his thoughts to himself. Just like in the movies. If humor is what you are looking for then you can’t go wrong with Saints Row IV. It’s Borderlands to the next level. It’s stupidly nonsensical but don’t let that fool you as the gameplay is pretty solid. The game has an open world go anywhere, do what you want setting and that adds to the fun. The main quest will task you with saving the world from aliens and you’ll be surprised to see what weapons can be used in the process. Put on the funkiest costumes and be prepared for hilarious dialogues. Co-op action gives players the chance to explore the crazy Saints Row IV world with a friend. BioShock is a game series that is a must if you are looking for good gameplay, captivating story, and unique atmosphere. It is played in first-person perspective just like Borderlands and it has some RPG elements. The weapon selection is your usual FPS arsenal but you can use custom powers so you will have plenty of ways to kill enemies. Freezing and then shattering them with the wrench is one way. When it comes to characters, yours might be the only sane one in the BioShock world. Or not, depends on how you choose to play. The story is amazing and the entire look and feel of the game is something out of this world. What do you get when you mix a tropical paradise with a zombie apocalypse? Dead Island, a survival action game with a focus on melee combat. You and your friends, the game has co-op, will explore the remains of a beautiful island and fight against hordes of zombies. The open world allows you to freely explore and uncover the cause of the zombie apocalypse. 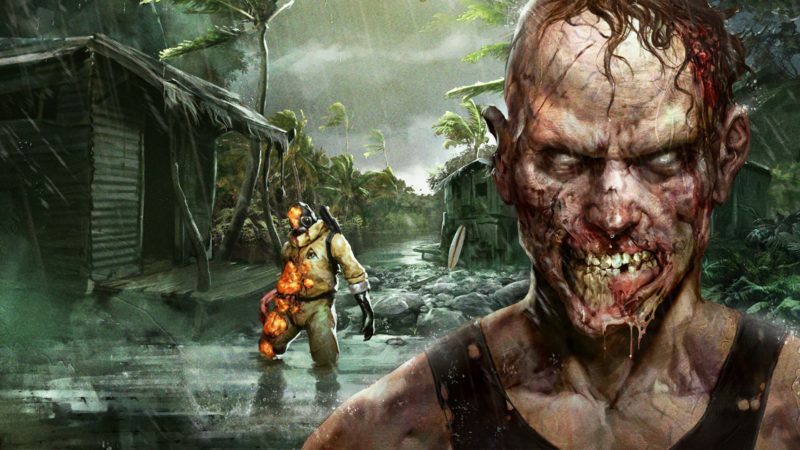 Get ready for some serious blood and gore as Dead Island is a horror game. If you’ve liked killing psychos in Borderlands, you’ll love carving your way through zombies in Dead Island. It doesn’t look much like Borderlands but it plays like it. 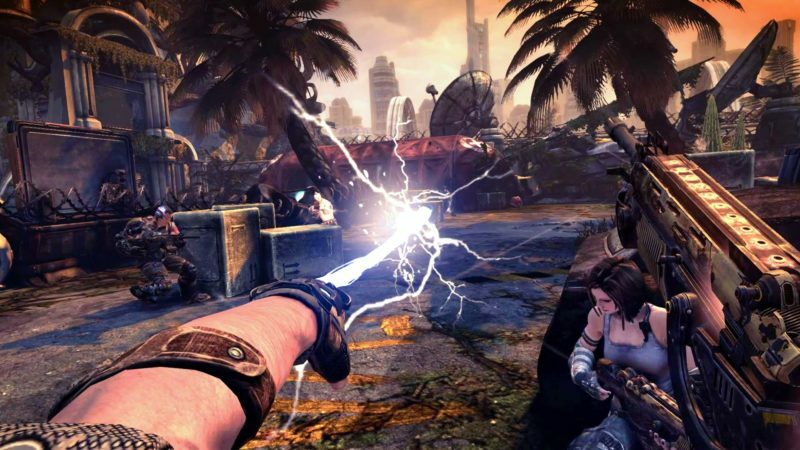 Bulletstorm is a first-person shooter action game in which you make your way through countless enemies in the most unimaginable ways. The game even has a system that rewards players for creative kills so let your imagination guide you. There is a single-player campaign if you want to play at your own pace or you can go online and have multiplayer fun on 12 co-op maps. The mutated enemies on the lovely planet of Stygia are awaiting your arrival. A good choice if you are in the market for some first-person shooter action, gore, and fun. 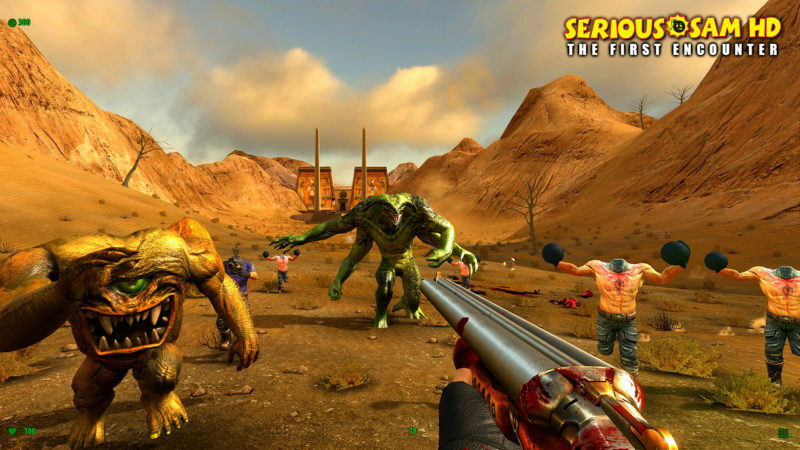 Just like in Borderlands, hilariousness is a staple of the Serious Sam series. There are several games in the series and all of them have positive reviews. The older ones are available in a remastered version. From chainsaws to flamethrowers, we cannot complain about the weapon selection. There are also several multiplayer modes such as co-op, last man standing, and survival that will satisfy your gaming social interaction needs. We mentioned a chainsaw but how do you feel about a chainsaw katana? 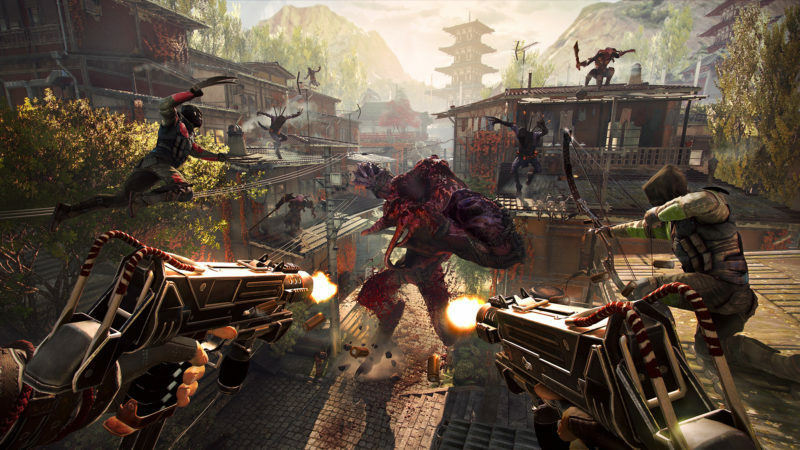 Shadow Warrior 2 is DOOM’s little brother who doesn’t take itself seriously but manages to win everyone’s hearts. The game has a great selection of weapons that can be customized. It also has a great selection of demonic enemies that can be killed in many ways. The game is played in first-person perspective and allows players to switch from melee to ranged combat. Get ready for some mature humor, hordes of demons, snarky comments, and Lo Wang’s version of My Favorite Things. Post-apocalyptic Russia in the aftermath of the Chernobyl disaster, first-person shooter gameplay, and lots of mutants to kill make a pretty good case for S.T.A.L.K.E.R. as a Borderlands alternative. The game lacks humor but it makes up with an atmospheric horror landscape. The gameplay mixes shooter action with RPG elements, stealth, and survival. Players can discover The Zone on their own in single-player mode or enjoy multiplayer that supports up to 32 participants. If you caught a taste of the Russian post-apocalyptic atmosphere, you might want to check out Metro as well. It’s a series of single-player first-person shooter games that take place in post nuclear war Moscow. We’ve listed 10 alternatives to the highly popular Borderlands series. What do you think of this list? If you do know of other games that are more suitable to be added to this list, do leave your comments below.